Well this sounds like the day at the beach from hell: a waterspout, which is sort of like an ocean tornado, made its way to land and uprooted a bounce house full of children who were hanging out inside before dumping them out and tossing the bounce house into oncoming traffic. Video on local television stations showed the waterspout — a whirling column of air and water mist — moving from the ocean onto the sand of Fort Lauderdale beach, tossing a canopy and rolling one of the bounce houses before lifting it into the air. The house flew above the tree line, but the children fell out when it first flipped over the beach, Dupree said. “They were immediately dropped out of the bounce house onto the sand,” he said. Both bounce houses had been secured to a basketball court as part of a city-sponsored family activity zone set up for a Memorial Day holiday event. The waterspout snapped a concrete pole holding a basketball hoop. I must confess: when I first read this headline, I thought that ‘waterspout’ meant ‘the spout from which water comes,’ sort of like a thing you hook up to a garden house, a.k.a. I had no idea what it actually is/was. But, no: a waterspout resembles something from a sci-fi movie—a quick Google image search reveals horrifying shots that have appeared in my nightmares at one point or another—and I can only imagine how scary it must have been to watch one of them make its way to the beach, much less be a kid trapped inside a bounce house while the spout lifts you up in the air. Just—(shudders). 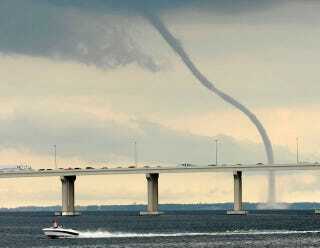 Unlike tornadoes, waterspouts don’t need thunderstorms for their funnel clouds to form. On Monday afternoon, a band of clouds was moving in from the ocean had winds favorable for waterspout formation, said Jeral Estupinan, a meteorologist with the National Weather Service in Miami. Thankfully, the children who were inside the house are okay—a few sustained minor injuries and fractures, but they’ll be fine.